"You want to know where sin and death is? You want to know where the gospel is? Jesus said a lot about peace and we still hear a lot about peace today. In some churches, they even "pass the peace" or "exchange the peace." No, it's not a code word for sharing drugs. It means the church-goers are going to get up and give each other hugs or handshakes and say something like "God's peace to you" or "Peace be with you" to everyone in the room. Yes, even the shy folks trying to hide in the back are going to get a dose of God's peace. Because they are celebrating--commemorating--what Jesus did. He bore the violence of sin & death on the cross--defeating them both so that we can have peace. Not fluffy, rainbow-y peace. Not-two-fingers-in-the-air-barely-visible-through-the-pot-smoke-peace. Peace in our relationship with God. Peace in the face of our own death. Peace in the face of hardship. 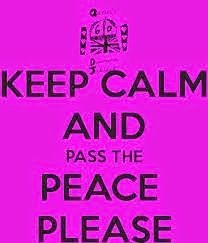 Peace that passes understanding. 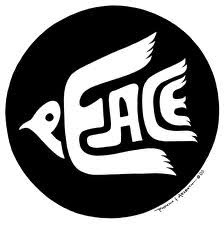 Peace that extends beyond feeling into faith and action. Peace that soothes, simmers down, and supports. Peace that forgives and heals. We may seem like we are a long way from peace and we are. But there is a lot of peace out there if you turn your eyes away from the news for a minute. Those serving Easter dinner to the poor and homeless this weekend. The family who took in a foster child. The junior higher who stood up for her friend when he was being bullied. The co-worker who helped two warring clients find a compromise. The crisis center volunteer who takes a phone call from a suicidal teen. The youth advocate who helped a teenage girl through her pregnancy. The gang counselor who helped a hardened street thug find a job. The soccer coach who insisted on good sportsmanship from all his players. The college student who stayed sober and drove his friends home after the party. The woman who lost her leg in the Boston marathon bombing who helped a child from Latin America walk again, too. These are just a few of the peacemakers out there. They are sharing the gospel whether they realize it or not. True, we will not find complete peace until we are reconciled with the ultimate Peacemaker and he restores and harmonizes all creation - makes it the way it was supposed to be before it was war-torn by the sins of violence, hatred, arrogance and greed. However, that is not an excuse to just be complacent--to just wait, hope for the best and pray. It is not enough to "give peace a chance." We must PASS the peace. See where you find the peacemaking story of Easter today and let's pass the peace wherever we are. I'm Feeling a Little "Loopy"